Find city information about North Reading, MA including homes for sale in North Reading. Cape - 60 Wentworth Ave North Andover, MA 01845 is now new to the market! "Real estate for me isn’t simply a profession. It’s a passion." With more than 35 years experience in the real estate industry, Stephanie L. Jones has managed multi-unit developments, overseen portfolio properties from Michigan to North Carolina, and currently works as a top producing real estate agent for Berkshire Hathaway Verani (BHHs). Her limitless energy, high quality representation of clients, and individualized marketing strategies has earned her numerous awards and accolades. In the last three consecutive years, she was named a member of Berkshire Hathaway’s President’s Circle and in 2017, earned the coveted Chairman’s Circle Gold status which ranks the Top 3% of Warren Buffet’s Berkshire Hathaway Home Services business. Stephanie works with clients seeking to list, buy, rent or relocate to Boston's beautiful North Shore and proudly serves the towns of Andover, North Andover, North Reading, Haverhill and Methuen Additionally, she maintains vast knowledge about Cape Ann and seacoast towns spanning Massachusetts and southern New Hampshire. Stephanie is well-versed in residential real estate as well as commercial and investment properties. Her established relationships with area developers has secured her position as the go-to realtor for blossoming properties across the Merrimack Valley. Most notably, the bulk of Stephanie’s client base has been developed through trusted word-of-mouth referrals and long-standing relationships, a clear differentiator in today’s real estate marketplace. A self-proclaimed "roll up my sleeves kind of gal,” Stephanie leads the Sold By Stephanie Team without pretense and completely by example. By placing the needs and interests of her clients first, she has developed and nurtured relationships not only with home buyers and sellers, but area developers. With years of staging expertise, Stephanie works her magic to transform listed properties into destination locations. Her unique vision highlights the most beautiful elements of a space, while minimizing those that distract attention. A member of the Berkshire Hathaway Home Services (BHHS) Verani team, Stephanie has helped expand the brand across the highly competitive Andovers region. She is a Certified Home Marketing Specialist (CHMS), Fine Home Specialist, and a Certified Buyer’s Specialist (CBS). 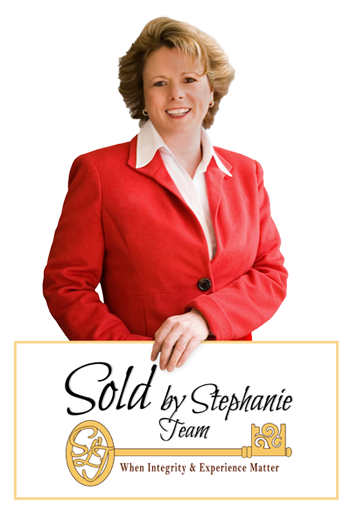 Listed consistently as a top producer and receiving accolades annually for exceeding fiscal milestones in her territory, Stephanie and the Sold By Stephanie Team stands ready to support you as you navigate your real estate journey.